The sturdy and stable Pride Victory 10 3-wheel is the only scooter in its class with a generous 400 pound weight capacity to accommodate more users. Standard seating includes viscoelastic foam inserts, front to rear sliders, and eight-position rotation. The overall length is 45.25 inches, giving more legroom for taller riders. The charging port is located on the tiller, making it a breeze to access. The Victory 10 mobility scooter by Pride delivers high performance with a sleek, sporty design. It features one-hand Feather-Touch disassembly for easy transport. The long lasting high-intensity LED headlight offers great pathway illumination for additional safety when you are out after dark. Advanced standard features that include flat free non-marking tires and a wraparound Delta tiller, the Victory 10 is a greater value than ever before. You Will Love Your Pride Victory 10 for its versatility, size and value. 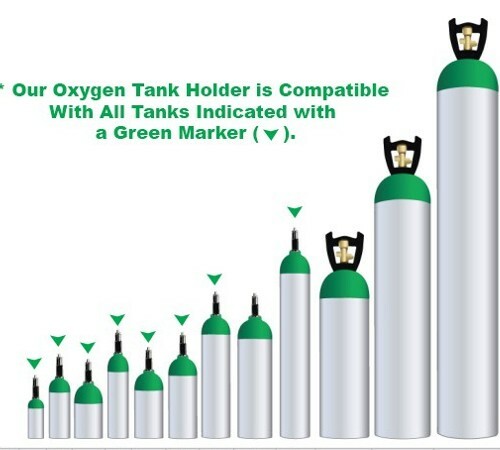 It can be used both indoors and out and can be disassembled for transport with the easy Feather-Touch control system. The Pride Victory 10 is made in the USA by American citizens with a quality standard all their own. 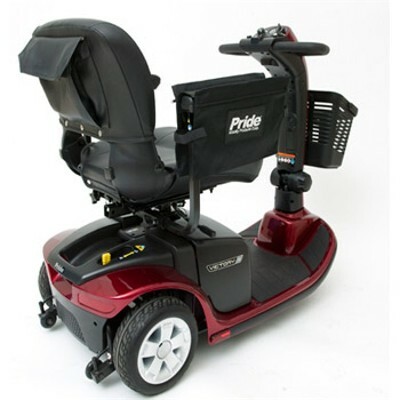 Support Quality, Support America and own the most dependable scooter ever made by Pride Mobility Products.... .
Seat-to-Deck Height Range 17.5-19" 17.5-19"
The Patented Locking Scooter Coach is now available for the Pride Victory 10 3 Wheel Scooter. 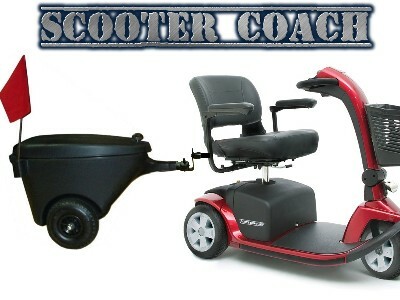 The Scooter Coach is a water proof trailer that allows you ten times the capacity to bring things along with you that you would normally leave behind as ell as a piece of mind knowing your items are under lock and key. The Scooter Coach not only can serve a safe locking cargo, it can also serve as a ice cooler to keep food and drinks cold as it is completely water tight and water proof with a weight capacity of 500 pounds. 40 AH High Performance $200. Medium Back Height 18 Wide X 16 Deep $715. Medium Back Height 20 Wide X 18 Deep $715. Medium Back Height 22 Wide X 18 Deep $715. High Back Height 18 Wide X 16 Deep $715. High Back Height 20 Wide X 18 Deep $715. High Back Height 22 Wide X 18 Deep $715.